Water Sports Instructors are running a high-quality water sports program and courses. Water Sports Instructors are maintaining and hiring water sports equipment to the guests. Water Sports Instructors are going to independently run a high-quality water sports program and courses following the TUI MAGIC LIFE guidelines and concept with a positive attitude. To run the program, practical experience of water sports is a must. 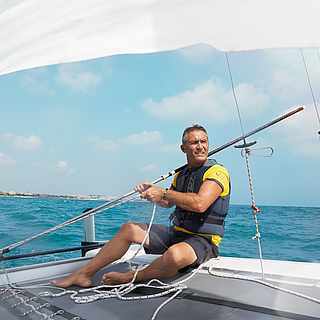 For surfing and sailing, TUI MAGIC LIFE expects the Water Sports Entertainer to have a VDWS sailing and/or surfing license, a VDWS Instructor license is a bonus. Water Sports Entertainers are responsible for the guests safety during their program. This means that they are supervising and rescuing guests with hired equipment. A first aid certificate (no older than 2 years) and a bronze lifesaving certificate from DLRG or equivalent are required. When not running the program, the Water Sports Entertainers are running the water sports equipment hire system and organize the administrative work associated with the water sports facilities. To satisfy their remit, the Water Sports Entertainers have founded practical knowledge to perform maintenance and repair of the equipment. Water Sports Entertainers are having a good constitutional fitness level and are tough enough to run their program at the beach also with southern climate conditions. A marine powerboat license is an advantage for a Water Sports Entertainer but not required. Ideally, the Water Sports Entertainers do not only speak English but also German and other languages fluently.